LP0136. OKLAHOMA!, Original 1943 Cast, w.Alfred Drake, Joan Roberts, Celeste Holm, Howard Da Silva, Lee Dixon. Decca early black label DL 8000. MINT copy has, Sd.1 only, minuscule paper scratch, inaud. "The original Broadway production of OKLAHOMA! opened on March 31, 1943 at the St. James Theatre in New York City. It was directed by Rouben Mamoulian and choreographed by Agnes de Mille. It starred Alfred Drake (Curly), Joan Roberts (Laurey), Celeste Holm (Ado Annie), Howard Da Silva (Jud Fry), Betty Garde (Aunt Eller), Lee Dixon (Will Parker), Joseph Bulloff (Ali Hakim), Jane Lawrence (Gertie) and Barry Kelley (Ike). The production ran for 2,212 performances, finally closing on May 29, 1948. The demand for tickets was unprecedented as the show became more popular in the months that followed the opening. OKLAHOMA! ran for over five years, a Broadway record that would not be bested until MY FAIR LADY (1956). The Tony Awards and other awards now given for achievement in musical theatre were not in existence in 1943, and therefore the original production of OKLAHOMA! received no theatrical awards." "Alfred C. Drake, the award-winning performer who created the lead role in OKLAHOMA! and other stage hits and sang many of Broadway's most beloved songs, after his universally acclaimed appearance as Curly in OKLAHOMA! in 1943, went on to star in the original casts of KISS ME, KATE in 1948 and KISMET in 1953, the 1973 revival of GIGI and many other shows. His rich baritone voice introduced Broadway audiences to songs that endured among Broadway's most popular classics. Mr. Drake's performances earned many awards. He won his first Drama Critics Award for playing Curly in OKLAHOMA! in 1943 and his second for Hajj in KISMET 10 years later. KISMET also garnered him the Tony Award and in 1990 he received a special Tony Honor of Excellence in the Theater for his body of work. In 1981 he was inducted into the Theater Hall of Fame. He recorded several cast albums and other records as well, including CAROUSEL with Roberta Peters. Although his musical roles brought him fame, Mr. Drake was also a serious actor and played in many dramas. His stage performances included co-starring with Richard Burton in HAMLET in 1963, and with Katharine Hepburn in MUCH ADO ABOUT NOTHING in 1957. His last major drama was in Jose Quintero's production of THE SKIN OF OUR TEETH in 1975. 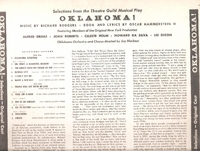 Elliot Norton, then a reviewer for THE CHRISTIAN SCIENCE MONITOR, was among many critics struck by the moment when the curtain rose in OKLAHOMA! and Mr. Drake began singing 'Oh, What a Beautiful Mornin''. He wrote about the first night: 'In that scene and song, American musical comedy took a new turn away from stilted nonsense towards something like truth and beauty. And Alfred Drake, because he got all that into his manner, his bearing and his exuberant natural singing voice, became in effect the herald of a new era'. Brooks Atkinson of THE NEW YORK TIMES wrote of KISS ME, KATE that 'Mr. Drake has become about the most valuable man in his field', and wrote of KISMET: 'Alfred Drake gives a superb performance. He sings like a thoroughbred and with one of the best voices in the theater. But Mr. Drake is also an immensely resourceful actor'."